I just love this time of year with all the football parties and holiday parties on the horizon. Even though I’m from the south, I’m not very much of a big meal type of person. I much more enjoy eating small meals throughout the day and having bites of this and that as I can often never make up my mind of just one dish that I want. As you can probably guess, I love appetizers. That’s why I look so forward to party season so I have an excuse to make a ton of appetizers. 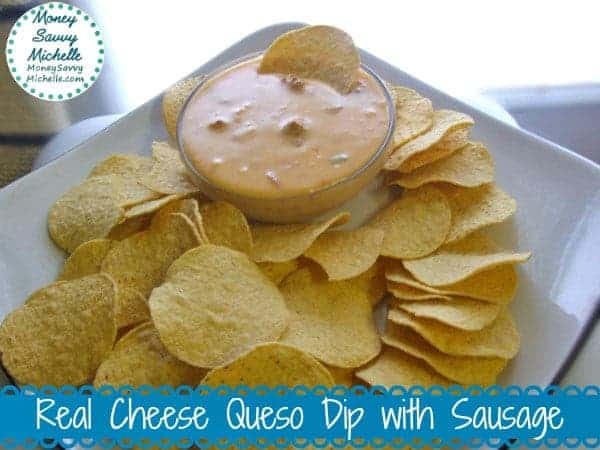 I think one of the all-time favorites of most of us at parties and gatherings are a variety of dips, especially a queso or cheese dip. Normally, I would use a block of Velveeta, but since it is a cheese “product” and I am really trying to eat less processed foods, I wanted to try to make a real cheese queso dip. I was a bit skeptical that I could come up with a dip that is actually creamy enough to not break chips AND not be gritty. I have to say I pleasantly surprised myself as this real cheese queso dip with sausage is actually super creamy and no grit! The cheese is pretty much the most important part of this queso dip recipe. You want a cheese that can melt nicely without being grainy as I mentioned before, so I opted to use half mild cheddar and half of a Mexican-style blend that we get from Costco. It contains monterey jack, cheddar, queso quesadilla, and asadero cheeses. Mr. Savvy said that while good (and he had no problem scarfing down the bowl in the picture), he thought the cheddar was a bit overpowering. I, however, really liked the flavor it added. Either way, I would suggest any sort of blend of cheddar, jack and/or American cheeses. I also love adding sausage to this queso dip to make it a bit more hearty and filling – not to mention it’s certainly a man-friendly food for all those football games. We like our cheese dips spicy, so I decided to use a chorizo along with the hot version of Ro*Tel. If you like your foods on the tamer side, you can, of course, use a mild sausage (turkey sausage also works great) and a can of plain chopped tomatoes and onions. On the other hand, if you want to make it even spicier, you can add in some cayenne, chopped jalapeno or other chiles. This dip is best served warm, and it will really thicken after it starts cooling down, so I like to serve it in this Little Dipper Crock-Pot so it can stay warm. 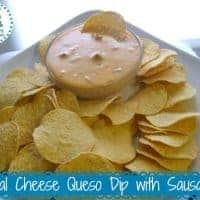 This queso dip recipe is a nice alternative for those who wish to use real cheese instead of popular cheese block products. Crumble and brown sausage in a medium-sized skillet over medium-high heat. Remove from pan and drain on paper towels if needed once done. In the mean time, melt butter over medium-low heat in medium to large saucepan. Once butter has melted, add flour and whisk together completely. Allow to cook for 1 - 2 minutes so final dip doesn't taste floury. Add in garlic, onion and Ro*Tel or other tomatoes and whisk until completely combined. Mixture will be thick. Allow to cook for another 1 - 2 minutes, stirring often. Slowly whisk in milk and allow to cook another 2 - 4 minutes, stirring often. Whisk in cheese 1 cup at a time, making sure cheese is thoroughly melted in before adding another cup. If it is taking a long time for cheese to melt, you can turn up the burner heat slightly. Once cheese has been mixed in, whisk in sour cream to desired creaminess. Taste for seasoning and add as much salt as desired. I leave this until the end because some cheeses are saltier than others. Stir in or top with optional seasonings such as jalapenos or cayenne, if desired. Serve with tortilla chips, pita chips, pretzels rods, bread sticks or whatever meets your fancy. You can keep the dip warm for an extended period in a slow cooker set to low or over low heat on the stove as you need to refill. Store leftovers in air-tight container in the fridge and reheat over low heat, adding a bit of milk as needed. All sorts of sausage can be used in this recipe including breakfast, Italian,turkey, chorizo, etc. Also feel free to add a variety of peppers, onions, etc. for extra spice and flavor. Check out our candied bacon footballs and loaded chicken nachos for more party eats if you enjoyed this real cheese queso dip with sausage! I love cheese dip. This homemade cheese dip looks amazing. This is a great recipe. I love Queso cheese dip and think its not even too hard for me to make! Thanks for sharing. This looks so yummy! I love chips and dip! This looks so good! I’ve been looking for a queso dip recipe. I’m going to be adding this to my football recipes. Thanks!